Since 2013, we have already carried out three large-scale election surveys, in which we investigated how elections would have turned out if citizens had voted through Janecek Method (D21). We carried out these surveys in 2013 during the elections of the Chamber of Deputies of the Parliament of the Czech Republic; in 2014 during the Senate and Municipal elections, and in 2018 during the Presidential election. To date, the most extensive experiment with the Janecek election Method (D21) has been the Prezident 21 social game, running online from December 2016 to January 2018. We wanted to present the Janecek voting system in an interactive way and increase citizens' interest in the Presidential election at the same time. Thanks to Janecek Method (D21), participants could cast up to three plus votes and one minus vote. Over 3 million Czechs visited the site; 326,790 voted after verification by telephone number. We supplemented the results of the online experiment with a representative survey of the eligible voter population in the Czech Republic, which took place during the first round of the Presidential election, with 2,568 respondents participating. Data collection using the CAPI methodology was performed by STEM/MARK and Median. Using Janecek Method (D21), the election results would have been different, with Jiří Drahoš winning. Voters are interested in multiple votes; 83 % of respondents used more than one vote. 17 % of voters used a single vote, ⅔ of whom voted for Miloš Zeman. The experiment confirmed the findings of previous surveys on the use of the minus vote: voters use it constructively against candidates whom they really do not want to win; not in a tactical manner against competing candidate. 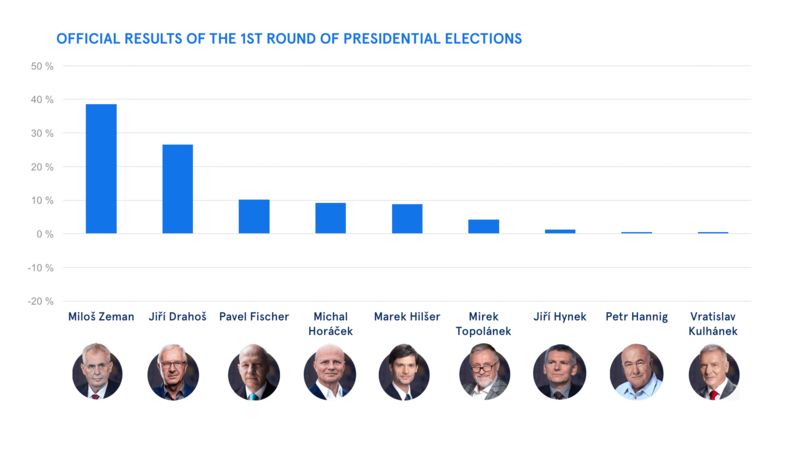 The experiment showed that if voters in the Presidential election could have cast three plus votes and one minus vote, Jiří Drahoš would have become the Head of State and more people would have been satisfied with the result of the election. 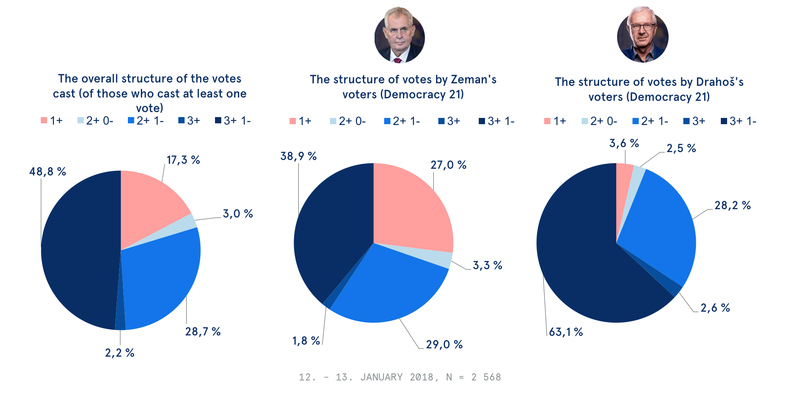 In the current majority system, Miloš Zeman won the Presidential election, even though he is a polarising candidate, chosen by one part of the population and rejected by another part. This outcome is evidenced by the similar number of plus and minus votes he received in the survey. His voters are highly opinionated and less willing to sympathize with other candidates. A total of 83 % of respondents used the option of casting multiple votes in the survey; 77.5 % of respondents cast a minus votes. On the other hand, a minority of 17 % of voters cast only one vote. Two-thirds of these voters voted for Miloš Zeman. KSČM voters (35 %), people with elementary education (28.1 %) and people over 70 (25.1 % of them) constituted the largest share of the electorate who stuck to casting a single vote. On the other hand, people with higher education and young people often cast all votes, making full use of the potential of the Janecek Method (D21). The research aimed to compare the results of the elections, using the current two-round majority system and the Janecek Method (D21). The election experiment was conducted in the form of an exit poll. Respondents were surveyed after leaving the polling station during the Senate and Municipal elections in 2014. The survey was conducted in 12 electoral districts out of 27, with a total of 4,750 respondents. The survey was conducted by Market Vision. The central hypothesis was that the Janecek system would afford more consensus compared to the two-round majority system. The second hypothesis assumed that the effect of multiple votes would weaken competition among middle candidates. It is often the case, not only in the Czech Republic, that because of increased competition in the middle of the political spectrum, these middle candidates often eliminate each other, and candidates who have no support among the general public or even populists or extremists proceed to the second round. The goal of the experiment was also to confirm or refute the results of the 2013 survey, specifically on the use of minus votes. The first experiment clearly showed that voters do not use minus votes against direct political opponents, but rather to spontaneously label candidates they find unacceptable. 4,750 respondents participated in the Senate elections poll, selected representatively in relation to the population of the constituency. The experiment took place in 12 out of 27 districts. The voters were asked to fill in a questionnaire when exiting the polling station, in which they could cast two plus and one minus vote for all candidates across the political spectrum. The central hypothesis that Janecek Method (D21) will produce significantly more consensual results was only partially confirmed in the experiment. The first position changed in only 2 out of 12 constituencies. The most interesting example is the result from the electoral district of Zlín, where the Social Democratic Party candidate (ČSSD), Alena Gajdůšková, won in the Janecek system, defeating František Čuba from the Citizens' Rights Party (SPO). The second example of a difference in results was Česká Lípa, where Karel Tejnora, the candidate of the Civic Democratic Party (ODS), won in the Janecek system, but was placed third in the first round of the real elections. Although the change in first position was achieved by the Janecek Method (D21) only in two districts, the hypothesis of lowering the competition in the middle of the political spectrum is partly confirmed by the changes in the second and third places in three constituencies. These differing results for the second and third positions in the first round of real elections point out that the majority two-round system, among other things, makes it impossible for candidates who have the potential to reach a broader electorate, to advance to the second round, compared to those candidates who have actually advanced to the second round. The results of the experiment also show that a one-round election using Janecek Method (D21) can “predict” the winner of the second round in most cases. This conclusion also needs to be confirmed by further experiments. However, we may hypothesise that the introduction of the Janecek system in place of the current two-round elections in the Senate could significantly lower election costs and also increase the low average turnout in both election rounds. The 2014 election experiment confirmed the viability of Janecek Method (D21) and proved it to be a full-fledged alternative to majority voting systems. More experiments still need to be conducted, but the data now show that Janecek Method (D21) leads to more consensual results compared to majority systems. Thanks to the effect of multiple votes, which is the main component of the Janecek Method (D21), voter satisfaction can also be better measured (the “satisfaction index”). Thanks to the fact that voters can support multiple candidates, the number of voters satisfied with the winner is easily demonstrated. Particularly in comparison with the one-round (relative majority) system, the results lend more legitimacy to the elected representatives. We aimed to create a model situation for the direct election of mayors, which is widely debated in the Czech Republic, with draft laws on its introduction appearing regularly. For the purpose of the experiment, local candidates for political parties were selected as mayoral candidates. We surveyed election results using the Janecek Method (D21) versus a one-round majority system, known as “first-past-the-post” (FPTP). The experiment was carried out in 15 municipalities, divided by population into three categories. In all municipalities, the survey was carried out on a representative sample of the population. A total of 4,129 respondents took part. It was run by Market Vision. The respondents received basic information on how to vote using the Janecek system and then responded to the question of whom they would elect as Mayor if they had one vote. They then cast a vote using the Janecek Method (D21), using up to two plus and one minus vote(s). In addition, participants answered three questions to survey their knowledge of the current system of municipal elections. The test of the direct election of mayors confirmed the hypothesis that the Janecek Method (D21) will yield different results to first-past-the-post (FPTP). Out of the 13 municipalities, where FPTP and the Janecek Method (D21) were fully tested, there was a change in the winning candidate in three municipalities. Changes in second and third places were even more frequent. These occurred when minus votes in six municipalities were counted. Just as in the case of the Senate elections, the test of the direct election of mayors also confirmed that the largest number of recipients of minus votes received these votes from voters across the political spectrum. The result in Prague is particularly remarkable, thanks to the capital's uniqueness in terms of population. Tomáš Hudeček (then in TOP 09) won the direct election, even though his party was placed second in the elections. Hudeček won in all the tested election variants. He won first place by 3 % of votes ahead of Adriana Krnáčová from ANO in both the FPTP and the Janecek Method (D21), without counting the minus votes. The data also show that half of the voters (50 %) in the Municipal elections casts the whole candidate list into the ballot box, thus supporting one particular party. Less than one-third (29 %) of voters use only a few preferential votes and choose specific candidates. About one-fifth (21 %) use both options. Tests to verify voters’ knowledge of the system confirmed the opinion of political scientists that most voters do not understand the system of Municipal elections. One-third of the respondents (33.3 %) responded correctly to the simpler of the two questions, while two-thirds gave an incorrect answer. In the case of the second, more complex question, less than one-fifth of respondents (24.2 %) gave the correct answer. 17.7 % avoided giving an answer, and the rest gave incorrect answers. The election experiment in 2013 took place on a representative sample of 2,533 respondents at the time of the Czech Chamber of Deputies elections in 14 regions. The voters received a ballot with the first two candidates listed for each candidate party in the given region. Respondents could then award four plus and two minus votes directly to candidates across the political spectrum, rather than to the parties. Survey participants could (but did not have to) use all six votes, as the number of votes cast is voluntary in the Janecek Method (D21). The survey was conducted by Market Vision. As the Janecek voting system decides directly on candidates and not on parties, its application for the Chamber of Deputies elections would require a major amendment to the Electoral Law. It would mean voting not in 14 regions, but rather in 81 districts, as was the case in the Senate elections. Each party could nominate up to two candidates. The voter could cast four plus and two minus votes, and each district would yield two winners – future Deputies. Such an arrangement would very likely bring about a change in the strategy of nominating political party candidates – strong candidates would not always be nominated as opposing candidates in the same region, which is the situation we had to use in this election experiment. The findings from this survey must, therefore, be interpreted in a somewhat open manner. Specific election results would certainly have varied under other conditions for party nominations. However, at the same time, the experiment demonstrated some of the key effects of the system of multiple votes, pointing out possible electoral behaviour within such a system. In order to test different variants of Janecek Method (D21), simulation in the experiment took place with various variants of the number of minus votes – with two, with one and with plus votes only. This was the first extensive experiment using the Janecek Method (D21) in political elections in the Czech Republic. The main finding of the survey is that voters understood the proposed system without any difficulty; only 35 votes were void. The concern that Janecek Method (D21) could be too demanding for voters was thus refuted. We also refuted the idea that people are accustomed to using only a single vote, as is the case with the current Chamber of Deputies elections. 83 % of respondents spontaneously took advantage of the possibility of casting multiple votes; 29 % used the maximum possible number of four plus and two minus votes. 61 % of voters cast a minus vote. An absolute minority of voters cast only a single vote (17 %). The largest percentage of voters who stuck to casting a single vote were people with low political awareness and people from municipalities under 10,000 inhabitants (20 %), voters of KDU-ČSL, SPOZ (24 % of them) and KSČM (20 % of them). On the other hand, people with higher political awareness (38 % of them), young people (34 % of them), university students (34 % of them), entrepreneurs (36 % of them), people from medium-sized cities (36 % of them), people with above-average income (39 % of them), and voters of the Party of Free Citizens, ODS, TOP 09 and Úsvit (39 %, 34 %, 33 % and 33 % of them, respectively) most frequently cast all votes, making full use of the potential of the Janecek voting method (D21). However, with few exceptions, the differences in the use of votes were not significant across cohorts. In order to interpret the results correctly, we must remember that in 2013, ANO 2011 and Tomio Okamura's Dawn of Direct Democracy ran for the first time as new political subjects. Voters could not associate any significantly negative emotions with these parties, and that is probably why they did not receive many minus votes. This would probably change currently, after they have been on the political scene for a few years. In the basic examined model of the Janecek Method (D21) with four plus and two minus votes, these two parties received a large number of votes. The opportunity to cast multiple votes further benefits smaller parties such as the Green Party, the Czech Pirate Party, KDU-ČSL and SPO. The traditional ODS and ČSSD parties ended up with a lower percentage in the experiment than in the current proportional electoral system. Both these parties were associated with certain corruption affairs at the time. For ODS, it was the case of Jana Nagyová and Petr Nečas. For ČSSD, it was the case of David Rath. KSČM had the worst outcome in the experiment, receiving the largest proportion of minus votes, and would not win a seat in Parliament at all. In variants of the Janecek Method (D21) with only one minus votes and no minus votes at all, smaller parties achieved better results at the expense of large parties. It is also interesting to examine the minus votes, most of which were received by candidates of controversial parties such as KSČM, ODS and ČSSD. On the other hand, almost no minus votes were received by parties most likely perceived as underdogs. That was the case even though they could be described as extremist – for example, the Workers' Party. A small number of minus votes were also received by new parties and movements – ANO 2011 and Tomio Okamura's Dawn of Direct Democracy. The experiment has shown that by using minus votes, the Janecek Method (D21) can favour new parties and movements and make it easier for them to enter the political scene, or increase their support, compared to the single-vote systems. Furthermore, the Janecek Method (D21) gives a greater chance of success to smaller parties that are more uncontroversial, and can thus appeal to voters of other parties. These parties do not receive minus votes, and voters are not afraid that their votes for these parties will be “in vain”. More votes allow the voter to support more than one party in one election, and the voter does not have to strategically choose the “lesser evil”. Minus votes in the Janecek Method (D21) act as an element that calls out parties/candidates with a controversial (corrupt) past or an extreme attitude (KSČM). Receiving more plus votes then favours uncontroversial parties that seek to attract the widest possible range of voters. In terms of mandates, the results of this first experiment are somewhat vague, as it was a model situation using the first two candidates from each list. But we may assume that the parties would nominate their candidates using a different logic in Janecek Method (D21). These results are thus close to the results of the majority electoral system, whereas, in other surveys, the results of the Janecek Method (D21) in terms of mandates are closer to the results of the relative electoral system. More extensive research is needed to clarify this phenomenon. The ANO party would get 19 mandates in the 4+ 2- variant, ČSSD 3 mandates, TOP 09 3 mandates, ODS 2 mandates and the KDU-CSL and the Green Party 1 mandate each. In the 4+ 1- variant, ANO would get 17 mandates, ČSSD 7 mandates, TOP 09 2 mandates, ODS, and Úsvit 1 mandate each. In the 4+ 0- variant, ANO would get 13 mandates, ČSSD 10 mandates, TOP 9 3 mandates, ODS, and Úsvit 1 mandate each. It is also interesting to note that, from among leaders of the political parties, only Karel Schwarzenberg and Ondřej Liška would receive mandates in the Janecek Method (D21) 4+ 2- variant. Andrej Babiš would not get a mandate. Only Karel Schwarzenberg, Andrej Babiš and Tomio Okamura would get a mandate in the Janecek system variant, with one minus vote or no minus vote. However, it should be noted that this result of the simulation is caused precisely by the fact that the leaders were competing against one another in the same regions. However, we can safely state that none of the KSČM leaders would be elected to the Chamber of Deputies (they received from 9 to 27 % of all minus votes in their regions; Vojtěch Filip received most of them). Among politicians who received the largest percentage of minus votes are Vít Bárta (24 % of votes in the region), most ODS leaders (from 7 to 21 % of all minus votes in the region), Bohuslav Sobotka and Lubomír Zaorálek for ČSSD (16 % and 17 % of all minus votes in the region). Miroslav Kalousek lost the most, receiving almost one-third of all minus votes in the Central Bohemian Region (32 %). On the other hand, Jiří Běhounek (17 % of all plus votes in the region), Karel Schwarzenberg and Jiří Pospíšil (14 % of all plus votes in the region) were the most popular politicians in terms of plus votes. 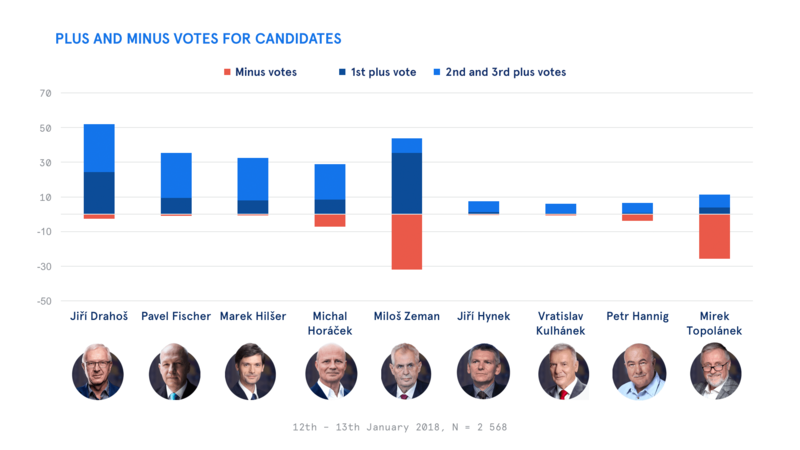 In terms of the sum of plus and minus votes, the most popular politicians are Jiří Běhounek (20 % of all votes in the region), followed by Jiří Zimola (19 % of all votes in the region), Roman Procházka, Martin Kolovrátník (18 %) and Karel Schwarzenberg (17 %). For more information about our surveys and their results, please contact Data Analyst Petr Bouška.